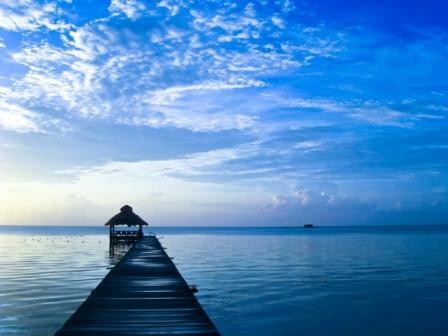 It's easy to see how retirement in Belize is the perfect solution. Real estate in Belize is very affordable, even when you choose to live in a vibrant and safe community packed with amenities like the Grand Baymen. The climate is amazing, English is spoken virtually everywhere, the cost of living is low, medical facilities are world-class and still affordable, the logistics of retirement are straightforward and the weather is beyond compare. Despite knowing all of that, many retirees are still worried about such a big change. To find out if retirement in Belize is right for you, and to get familiar with the great amenities that could be yours, plan a getaway to the Grand Baymen in Ambergris Caye. One of the things that retirees look forward to most is having more free time in their schedules to unwind, relax and enjoy their everyday activities. That is why it is so important to check out the amenities of the Grand Baymen in person. You might want to start right at the beach, where waves crash gently into the white sandy shoreline. You can then head over to the Grand Baymen's exclusive pier and marina, where you can do everything from get a ferry ride to Mexico to set off on a romantic sunset sail complete with champagne. Be sure not to miss the San Pedro Fitness Club, which boasts an outdoor swimming pool, fitness classes and more. Dine at the onsite restaurants, mingle with other retirees and get a real feel for what life might be like if you lived at the Grand Baymen yourself. Ambergris Caye is not part of the Belize mainland, which gives it a unique island flair all its own. Everything operates at a more relaxed pace, which is perfect for many retirees. Say goodbye to stress, say hello to extended happy hours and start making it a priority to watch the sunset each evening. One of the things you simply can't recreate on paper is the island life that Ambergris Caye offers, which is why it is so important to experience it in person. The only true town on Ambergris Caye, and the destination closest to the Grand Baymen, is San Pedro. This fascinating urban area is the perfect blend of modern and historic, and it boasts everything from traditional local eateries to upscale European restaurants. You can shop for souvenirs, sip a cocktail overlooking the water or try dancing to live Garifuna music. San Pedro is a colorful, vibrant destination, and it is virtually impossible not to smile when you are lucky enough to spend time there. When you're able to give retirement in Belize a trial run while on vacation there, don't miss out on the chance to explore some of your favorite hobbies. Whether you are wild about deep-sea fishing, you've always wanted to go snorkeling or you're passionate about cycling, you can do it all while you're there. From the culture of San Pedro to the amenities at the Grand Baymen, there is no shortage of things to do, see and explore in Ambergris Caye. By planning an unforgettable getaway to the area, you can experience life at the Grand Baymen and see if retirement in Belize is right for you. Come to Belize and experience this beautiful paradise for yourself!